The Worlds first modern smartphone was launched 15 years before the iPhone. 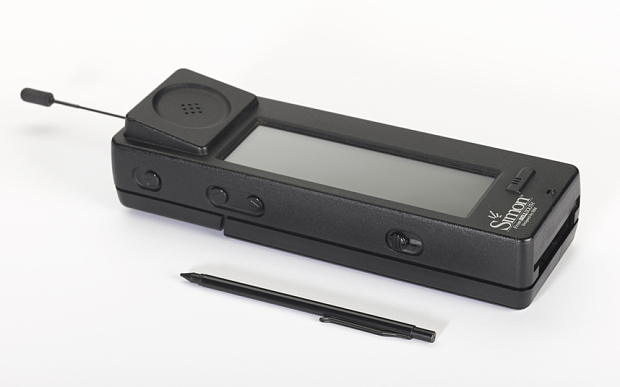 The IBM Simon Personal Communicator (simply IBM Simon) was the first touchscreen smartphone. IBM`s Simon was the first PDA (Personal Digital Assistant) to include a cell phone feature. The first prototype of Simon code-named "Angler" was showcased at the COMDEX computer and technology trade show in Las Vegas, Nevada, USA. IBM showed a prototype of Simon code-named "Angler" on November 1992 at the COMDEX computer and technology trade show in Las Vegas, Nevada, USA. This was the first phone of its kind to have features of both cellphone and a PDA. The reason why Simon was the first modern smartphone was that it gave users early access to make and receive a call, emailing, faxes, browsing. The phone was launched on 16 August 1994 with the price tag of US$899 and came with a 2-year service contract or US$1099 without a contract. Due to being overpriced, only 50,000 units were sold between August 1994 - February 1995. After some time the price was reduced to US$599 with a 2-year service contract. The Simon featured a touchscreen display measuring 4.5 inches by 1.5 inches and a resolution of 160 * 293 pixels. It was the first ever smartphone to feature apps using a stylus and a touchscreen display. You can send and receive calls, emails, faxes. Simon featured some advanced applications like a File folder, calendar, world clock, appointment scheduler, notepad and stylus input screen keyboard. You could also run third-party applications by using a special PC card to expand the memory. Other specs included 1MB of RAM, 2MB memory card support, 7.5V NiCad battery, and 510g mass. Each IBM Simon came with a charging base station, 2 nickel cadmium batteries and a protective leather body cover. Other optional accessories were PCMCIA card, RS232 adapter cable to link with PC, RJ11 adapter cable. The title of the first modern smartphone was given to IBM Simon. It paved the way for today's smartphones by introducing touch screen displays on the phone.